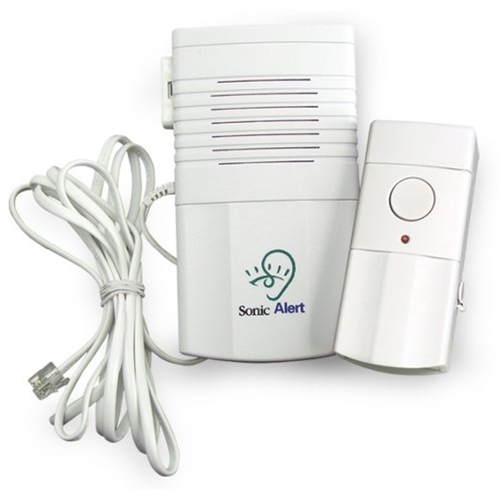 Sonic Alert DB200 Wireless Doorbell and Telephone Signaler from HealthyKin.com is the only doorbell & telephone signaler that requires no wires and can be installed in minutes. Unlike competing models, the DB 200 is not triggered by sound, so annoying false alarms are a thing of the past. Other advanced features include: selectable number of flashes (5 or 10), different flash code for front door, rear door, or intercom (requires additional sensor, sold separately), and a built-in chime for hearing members of the family (can be turned off). The DB 200 has a built-in outlet to flash an attached lamp and each sends a signal to all Sonic Alert remote receivers. The DB 200 has the additional feature of a telephone signaler. Just plug the phone cord into a modular telephone jack. Its low equivalent number does not draw any phone line power.